Get a chance to meet local journalists and members of the media, learn about their preferences, deadlines, and new ways to drive media coverage for your news. Also, join us for a great discussion on the First Amendment and how the free press is essential to PR professionals. Network with over 60 PR professionals from throughout the county. Advanced reservations strongly recommended; lunch is included. Member ticket cost applies to paid/renewed 2018/19 FPRA members. *Students must present current school ID. No refunds for cancellations after March 7th. $1 surcharge added for online payments. Gain Visibility to Local Public Relations and Marketing Professionals. 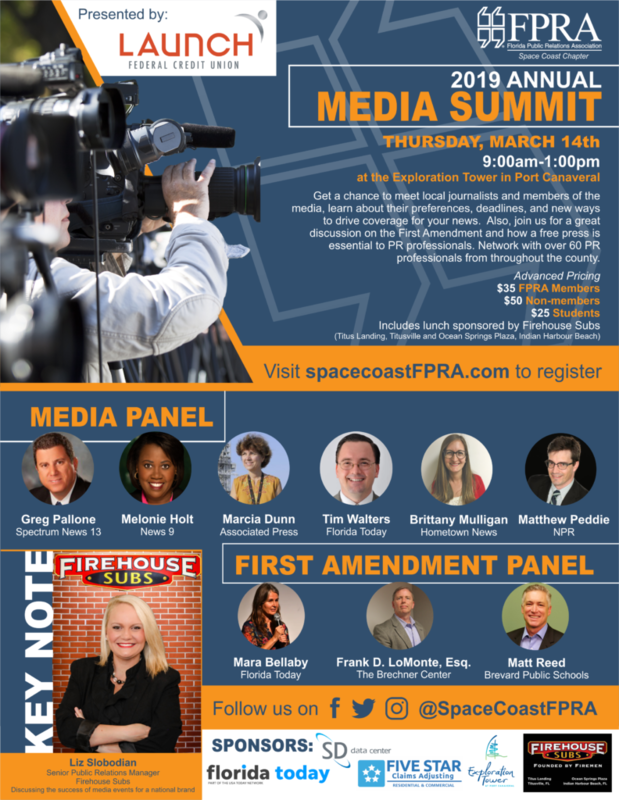 Media Summit is one of the premier events hosted by the Space Coast Chapter of the Florida Public Relations Association (SCFPRA) and typically attracts anywhere from about 60-80 Public Relations and Marketing professionals from around the County. For the past six (6) years, the SCFPRA has hosted this event to bring those professionals closer to our media partners. It gives them the opportunity to network with and ask questions of the top media representatives in our market, including some from the Orlando area. The 2019 event will be held once again in Port Canaveral at the Exploration Tower and will include a broadcast and print media panel who will answer questions and discuss the best ways to reach them, engage with them on social media and how to get their attention. Lunch is included. Also included at the Media Summit event is a special Keynote Speaker, Liz Anderson Slobodian, Senior Public Relations Manager for Firehouse Subs. Liz leads public relations and crisis communications for the brand of more than 1,155 restaurants in 46 states, Puerto Rico, Canada and non-traditional locations, and provides public relations services to a franchise community of more than 560 independent small business owners. For additional information or to secure your sponsorship, please contact Samantha Senger or Shona Price.